SoftPlanet makes it possible for everyone to get free Spybot Search and Destroy download directly from our servers. There is no registration needed for downloading. 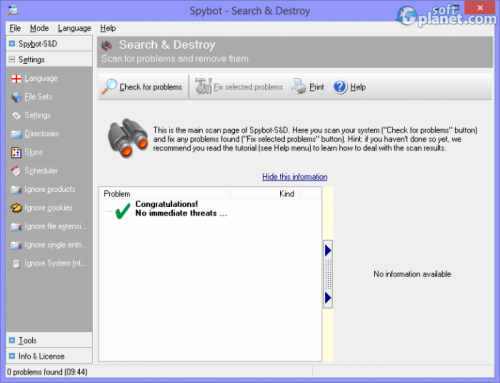 Spybot - Search & Destroy 2.4.40 is one of the oldest and one of the famous spyware and malware removal programs. Its job is to scan the hard drive for malicious software, protect web browsing and immunize the system. Before you start making any associations about it, we have to say that this application does not fully replace anti-virus programs. However once this free version is downloaded, updated and run frequently you can maintain your computer clean of threats. 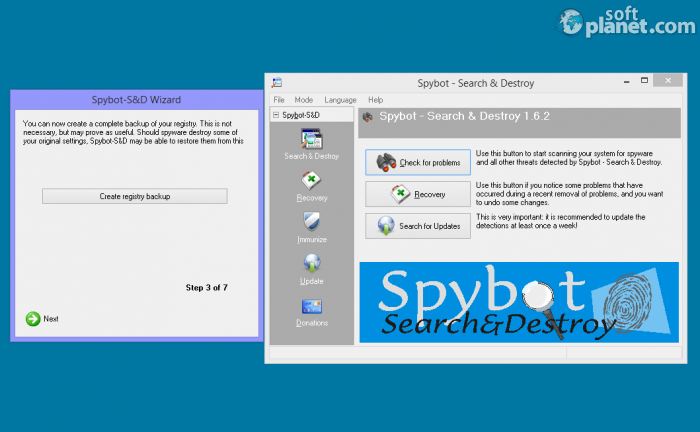 Spybot Search and Destroy 2.4.40 is fully compatible with the latest version of Windows OS, Windows 8.1. In addition, there are small changes to its GUI, detection methods and some other functional improvements. Spybot - Search & Destroy is free for individual users. Businesses and institutional users have to buy a license. In order to add antivirus protection you can upgrade your free version to the Home or Professional editions which are paid annually. In general the Home edition is for those who are not new to dealing with malware problems. Probably the best feature is that you can still be supported by email or phone even free of charge. Upon start Spybot - Search & Destroy goes through the program's wizard in order for a safe registry backup to be created just in case. Then the real program's face shows up. There are four menus on top. The Mode menu can be used to switch between Default and Advanced modes. When the second mode is selected, three more tabs show up on the left side of the application panel. The second one is the Settings tab from where many options and preferences can be set. 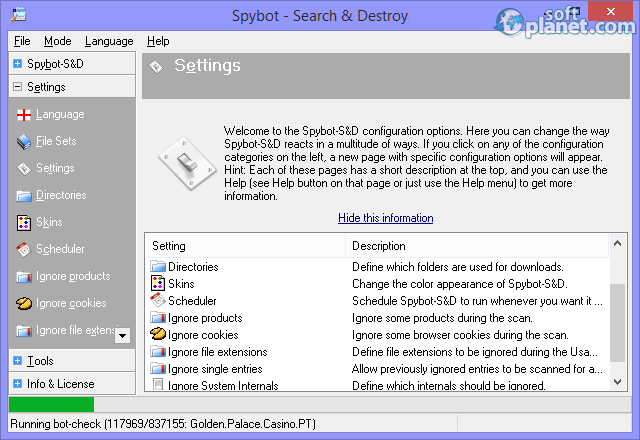 Spybot - Search & Destroy v2.4.40 is very easy to use. The first thing anyone can do is press the Check for problems button from the main tab. After a while the scan will finish and the results will be displayed with optional details. The Recovery tab can be used at any time to recover your system if anything happens while you are using Spybot - Search & Destroy. The Immunize tab allows you to take preventive measures against spyware by using all the methods inside your browsers. Spybot Search and Destroy 2.4.40 is capable of detecting and disinfecting your entire system from all kinds of infections, which harm your PC. The free version of the software definitely is a proper solution for you, However if you want to have even better protection against all threats, you probably need to purchase the software. Spybot Search and Destroy is VIRUS-FREE! Our security scan shows that Spybot Search and Destroy is clean from viruses. The current version of Spybot Search and Destroy has been scanned by our system, which contains 46 different anti-virus algorithms. That ensures that Spybot Search and Destroy 2.4.40 is 100% safe for your computer.